In Unlocking the Riches of Oz I noted the trend since the 1970s of winding back property-based revenues in the US and Australia and replacing them by increasing taxes on labour and capital. This reversed the manner in which infrastructure such as the provision of water, gas, electricity, highways, etc., had historically been funded out of the uplift in land values generated by these capital works, in favour of private-public partnerships (PPP) which can be seen as rent-seeking arrangements. As the privatisation of publicly-generated income from land and natural monopolies has continued apace, the returns to labour and capital have declined concomitantly (except, of course, in those industries invested in land and natural resources, such as banking, real estate and PPPs). That we’ve witnessed a remarkable decline in real average earnings and record levels of private debt since the 1970s is therefore no coincidence. The need to end the private capture of publicly-generated economic rents should be obvious now to all but the dullest of minds. 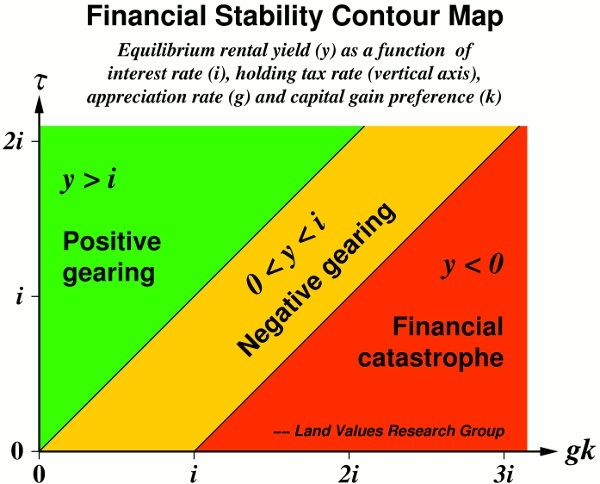 Dr Gavin Putland’s ‘Financial Stability Contour Map’ provides proof of this argument for the economics technicians. Right magnus the internet is a fight club, just be extra careful what you type the NSA and their friends might not like what you type, yes the internet is “free” righty o.
I hear what yur saying about shifting taxes around although i think yu fail to understand the “global” economy, a policy in australia will effect its competition abroad as everything is interconnected. Australia might be an island but most of the money in the country is brought in, when it leaves there will not be anything to tax. By the way why dont you people start a politcal party, the land tax party? Id prob vote 4 you, although most people with a house would not. bryan maybe you might leave the kids something behind to make life easier, its going to be tough competing with all those chinese and indians. But if they are stupid it wont last long. she created much more than she inherited, has employed more peple and paid more taxes than your entire family tree has ever paid. but yu still stick up for the public sector who live off stolen money and their services you have to buy at gun point. Bryan you are intellectually imoral or you have a problem with successful people. In the capitalist system you can inheret wealth, but are you guareeteed to keep it from the competition? If there is no competition, blame the state for creating monopolies through licences and restricting new entrents. Who again “bails out” corps?? the 1%? there is no left and right, the state has merged with its favourite children in the private sector. So blaming certain groups is an oxymoron. Anyway when interest rates rise, the liquidations will come along with a depression and cheaper costs of living. Some of your 1%’s will be bankrupt and some will join the 1%. Even in your marxist state, the 1% are around but every 1 else has nothing unless they inheret political genes or move up the ladder. Stick to your tax reform posts, but when you bring in class warfare, neglect to talk about the real problems you cannot be taken seriously. You stated income taxes were 1%, when the government grows it needs more taxes. Less gov spending with Lower taxes is the answer. Although certain people will be unemployable forever. Toughen up sweetheart. Try referencing something occasionally, so you thoughts have substance. Have you read Putland’s article yet? No? Then this is why you can’t see the clear shift of taxation burdens onto labour and capital, due to inadequate taxation of economic rents flowing to land, resources etc. This is the way the rich like it; hence explaining the creation of neoliberal trash economics to disguise these free rents (no effort involved), being classified as ‘capital gains’. If you haven’t realized the internet is a virtual fight club, particularly in the economics field (money = power), then you are beyond salvation. Spending is not the problem. Inadequate taxation of community generated and owned rents is the problem. Got it? Successful? Gina Rinehart inherited her tax-leeching on our iron ore resource from her old man. At least he took the trouble to find it. there in lies the rub, they WILL always spend more than the taxes its gone on thru history even the old kings used to shave gold off the side of coins. So you see the spending is the main problem. Unless career politicians are banned, they are easily bought or get greedy and corrupt society thru bribes to get re elected, just look whats going on prior to the election. These people do not work or produce anything at all. Id rather gina rienhaht be the Pm, at least the woman has run a successful business. Abbot or the other winner would bankrupt a 7 eleven. Hmmm … What’s the downside? Um, the price of goods and services 50% of what they are currently because it’s not labour that’s the greatest component of all prices, but the cascading effects of all the taxes and deadweight. Nope, the removal of taxes and their deadweight would be a benefit, wouldn’t it? The need for social welfare abolished because a land rent-based economy would provide a universal basic income to everybody. Bye bye social welfare. Nup, that’s a benefit, too. Less tax-induced crime? No. No more being ripped off by the 0.1% BIG rent-seekers who make themselves billionaires at our expense? No, that’s a benefit, too. OK, I give up, I can’t see any downside. On the other hand, as you say Gonzo, it’s one thing to derive your revenues from the right place, but if governments still misspend that’s a real problem. So, the community has to ensure governments only fund NECESSARY bureaucracy. Again, looking at how much “taxes” are coming in is one side of the coin. If those spending those “taxes” spend them all without accountability, and are still allowed to borrow more that the citizenry will be indebted for, there is still a problem and a need for even more taxes. Magnus, im not attacking or demeaning anybody personally as you do like a 5 year old when he throws a tantrum. Im merely stating my thought to an idea, right or wrong. Ideas are not a one way street magnus, i cant imagine you are anything less than a beuracrat or an easily led pollyanna. I would prefer you dont read my posts and comment on them, just ignore me I do not like to mingle with a person like you. hehe, for the record i am not a paid troll. I do not work for the gov or a corp although im trying to make capital gains thru “investing”. I just adhere to the free market side of the economic thought, and taxing land and dropping income and capital would be better for me, i can see it creates other problems. Maybe if a real depression when it hits, structural changes can be made, until then a land tax only is impossible for it would destroy the economy and cause a panic selling with no buyers untill prices were cheaper to buy then rent. Every action has a reaction. I would like to hear from you gentleman the negatives on the land tax only theory in practice in the real world and the transition. What are the flip sides on this policy? Basically its a nationalisation of the housing industry and production from anything to do with land? I wonder how expensive food will get, might be good for genocide? Thus, ‘Gonzo’ needs to recycle Australia’s old myths e.g. alleged high wages and the public union bogeyman (when real wages are in fact stagnating and services everywhere are on the slide due to idiotic austerity) etc. Now Gonzo, time to remove your head from your arse. Feel free to debunk Putland’s analysis at your leisure also. I know quite a bit about how the US functioned in 1913, boyo. Read this and the sources quoted in the end notes for a hint of the real story. http://www.huffingtonpost.com/mary-manning-cleveland/detroit-tax-system_b_3734397.html The US used to tax land, and income tax was only a WWI measure. We’re offshoring jobs and industries now because all the deadweight generated by the taxation of labour and industry has ground western society to a halt. It’s not rocket science. Its got nothing to do with manufacturing being offshored along with tech jobs to india, where the pay is cheaper and less taxes and regulations to deal with. And the public service unions demaning ever increasing pay to keep up with inflation that has masked the declines in pay by using borrowing to replace the lost income. You sir have an agenda, but you dont want to open your eyes and see the big picture. Why do we need to tax land? or labour? capital? Go and read how the US was running before 1913. Best economic machine ever created. Your country is a socialised banana house, without natural resources it would be the shiitest hole in the world. Why is there no production from those resources? Like in japan, germany etc? Because you dont tax the land? gimme a break man, your in dream land. enjoy your safety and security and soon poverty.